Portable appliations have become very popular making it easy to carry all your favorite tools right on your USB Drives and use them on any computer without the need of any installations.LiberKey groups a lot of free software making it a True “swiss army knife” for portable applications.You can also update applications from the LiberKey application itself, making it even easier to have an updates version. LiberKey come in 3 different packages ( Basic, Standard and Ultimate ) and each package has it own set of tools arranged into different categories like Audio, CD/DVD, Education, File Management, Graphics – Photo, Internet, Networking – Server, Office, Security, System Utilities, and Video. 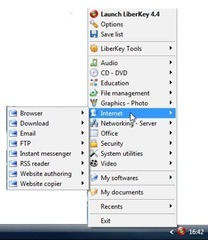 Access all applications from the LiberKey system tray icon. 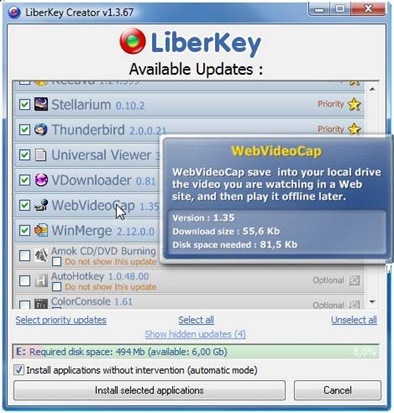 Check the complete list of software available in LiberKey here. For a list of softwares under each package click here. LiberKey is compatible with Windows 2000/XP/Vista. 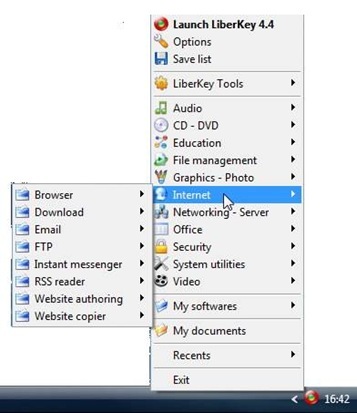 Similar Post Make Windows Always On Top,Translucent, Minimize, Hide Window, Enable Window, and Disable Window In a Single Click Using WinSpike. Make Windows Always On Top,Translucent, Minimize, Hide Window, Enable Window, and Disable Window In a Single Click Using WinSpike.